The wine just kept coming, red after red after red. As the servers started setting the glasses on our table, we fussily arranged them into neat arcs. But after a while, we gave up our attempts at organization, forced to overlap rows as the glasses just kept arriving. It was a great “problem” to have. The 17 wines that ended up in front of each judge on the afternoon of Aug. 11 represented one of the largest flights ever to ascend to the Best in Class Dry Red phase of the Michigan Wine Competition. (A glance at the record books revealed that this year’s number of sweepstakes-contending dry reds was matched only by 2009’s, says Karel Bush, promotion specialist for the Michigan Grape & Wine Industry Council.) It was a heartening sign for a region long known for whites and trying to gain a reputation for equally high-quality reds. Promoted to a full voting judge for the first time this year, I sat among two dozen sommeliers, winemakers, winery owners, wine writers, and other industry professionals at the annual competition at the Kellogg Hotel & Conference Center in East Lansing. Over the course of about nine hours, we collectively tasted 373 wines submitted by 48 Michigan wineries in the quest to find the best dry white and red, semi-dry white and red, fruit wine, sparkling wine, and dessert wine. Each of six four-person panels was assigned a series of flights arranged by style and/or varietal, representing a total of 59-63 wines throughout the day. 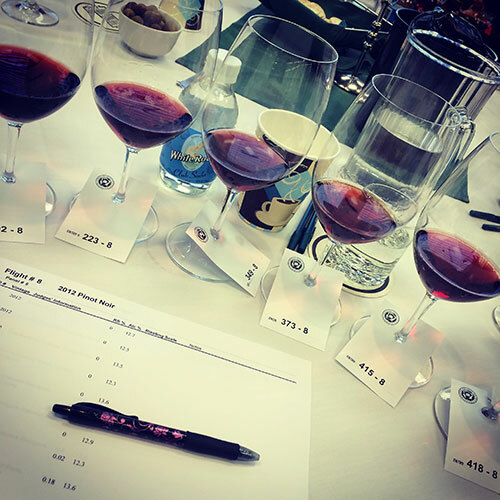 Judges individually recommended a medal — gold, silver, bronze, or no medal — for each competing wine based on quality and varietal correctness, with the final medal determined by the panel’s majority vote. Some wines earned quick consensus; others prompted spirited discussion. The 63 wines that earned gold medals — including 14 double gold, determined by unanimous gold vote among their respective judging panels — were “sent up” to the sweepstakes round. At the end of the day, all six panels sampled and voted on these wines contending for Best in Class honors. Bush noted that the field of submissions was smaller this year, down from 450 wines entered last year. She attributed the drop to the back-to-back severe winters that decreased many wineries’ production capabilities. This represented the Michigan Wine Competition’s 38th year, making it one of the longest-running wine competitions in the country, says Bush. Originally held at the Michigan State Fairgrounds, “it took place right next to the cattle barns, so you can imagine how difficult it might have been to be judging wines while you were enjoying the aromas of the cattle barns,” she jokes. The competition later bounced between a few alternate venues before relocating to the Kellogg Center, where it’s been held since 2001, she says. Though this year’s judging is over, the fun is just beginning for the general public. Each year, the Kellogg Center hosts the post-competition Gold Medal Reception, offering attendees a slew of wine sample tickets plus sumptuous (and plentiful) paired food prepared by the facility’s chefs and students. Participants can try all of the Best in Class, double gold and gold medal-winning wines, along with a number of silver medalists. This year’s event is set for Thursday, Aug. 20, 5-8 p.m. The cost is $40 in advance or $45 at the door. Vintage Michigan members receive $5 off their tickets when purchased by Aug. 17. The Kellogg Center is located at 219 S. Harrison Road in East Lansing. For more information or to get tickets, visit http://www.michiganwines.com/reception.